May this flame remain alive in our hearts in our happy times, in our struggling times and immpossible times throughout the year! May this year bring all our wishes somewhere near to fulfillment! Happy, Happy, A very Happy new year to each one of you. I was sleeping, sleeping and sleeping last few days and have just woken up dreaming about this blue heaven! Sleeping was strange enough but that is another story, another post. As of now let us get into this blue heaven of Italian designer Paola Navone in Milan. Above image : Specially made in Morocco these blue zellige (enameled tiles) decorates her home as she wanted her apartment to feel like a seaside place. In Paola’s lounge two white lamps designed by her vie for attention along with a strange fish and Moroccan trays. The simple dining room boasts of an immense marble table top and American bar stool type seating. This is creation of New York based graphic designer Ravi Hampole – a book – Nothing and Now here. Go through the pages of the book to override fine line between real world and illusion, erase the line between interior and exterior spaces and feel lost between spaces. Interior imagery is cut and juxtaposed with exterior imagery. Book is developed from an excerpt in the Tao of Pooh. More of his interesting work here. Can anyone beat sporting lines of this simple stunning vase! Designer Pawan Pagaria is a student at IIT, Delhi pursuing his masters in Design. I was about to put Apartment therapy (LA) in my credit links list with a thanks. But it seemed somehow incomplete! And the X-mas is just around the corner. So how about our kind of X-mas tree this season! ? 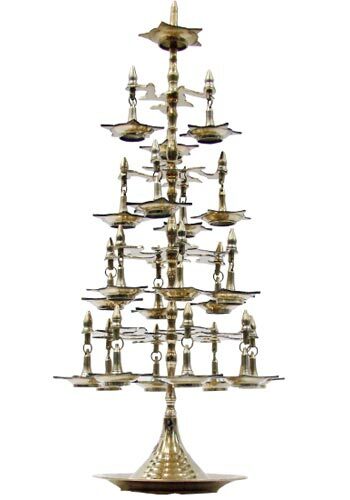 This is traditional brass multi-tiered oil lamp from South India. Just imagine how it is going to look when it is lighted! This is an eco-sensitive home built by architects Chirashree and Rahul Thakkar in the sands of Gujarat using local material and distinct vernacular flavour. I had this post as draft for a month now as I was searching for the architects’ direct link but I haven’t found it. I am unable to stop myself admiring the grand architecture of this house and modern life style synthesized with simple local culture. A variety of local stones were used in different forms as basic construction material, depending on the character of the stone and the wind direction. Sandstone slabs were placed over locally made pre-cast, pre-stressed concrete beams to form the roofing. This reduced the use of normal RCC by about 65 per cent. Sawn sandstone, rajula stone (a very hard basaltic stone), karoli stone and jaisalmer stone are used. There is plenty of natural light, large windows and enough ventilation to obviate the need for air-conditioning. The house is flooded with natural light without the heat. There is extensive use of greenery on the open land. Wild creepers, grass and shrubbery are allowed to grow unhindered on the sand dunes, so that they could anchor the loose sand. The inner and outer spaces are merged beautifully to provide a large extended living space. Staircase with arches defining the side and the space under it.